Using this structure, you can break down complex visualizations into digestible pieces, ensuring clarity and increasing engagement. For example, the image below shows how a chord diagram can be broken out into multiple stages. 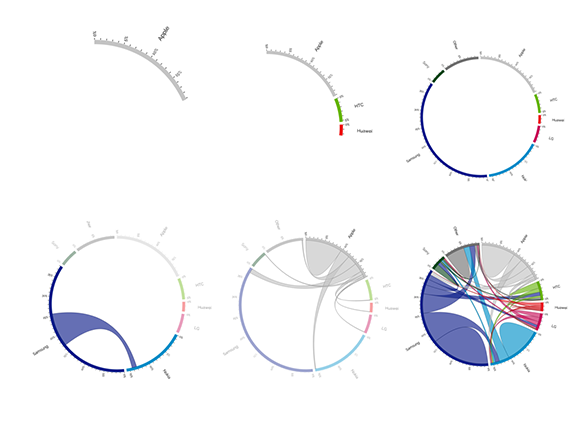 The interactive version, designed by Nadieh Bremmer, leverages a story structure to slowly introduce different pieces of data as well as different underlying variables. By exposing the components of the diagram independently, users are able to consider the aspects of the visualization more carefully. Image courtesy of Michael Freeman, used with permission. Using storytelling approaches not only drives engagement, but also provides opportunity to create more memorable, emotionally impactful visualizations. Properly introducing your visual representations is a prerequisite to them being understood, and storytelling provides an effective structure to accomplish this. Michael Freeman, MPH, is a lecturer at the University of Washington Information School, where he teaches courses on data visualization and web development. With a background in public health, he works alongside research teams to design and build interactive data visualizations to explore and communicate complex relationships in large data sets. His freelance work ranges from web design to software consulting, and examples of his projects can be seen "here":http://www.mfviz.com.